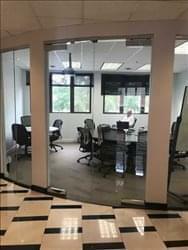 Find My Workspace lists over 95% of the executive office suites market in Vienna (Virginia). Simply click Request Quote to check pricing for one office, or Add to Basket for multiple offices. Find your new home here at this office space. With fully furnished offices and ready for you to move in tomorrow, it cannot get much better. This space understands the need for flexibility and growth. Your office comes with access to a wide variety of conference rooms; from boardrooms to 50 persons state of the art training rooms. Private offices start at $499/month (utilities and wifi included) and can be done with leases as short as 6 months. As a bonus, you will become a strategic partner in a business network, which is tied to the vast Tysons corner business network. Parking is free and there is ample parking for your clients when they arrive.